The 2012 Paralympics closing ceremony featured huge metal vehicles and steamy costumes. I created a gallery of images, plus you can watch the whole closing ceremony including appearances by Rihanna and Coldplay below. The performance was called The Festival of Flame and it certainly lived up to its name. It reminded me of being in Barcelona in the fall when they have their annual festival, La Merce. 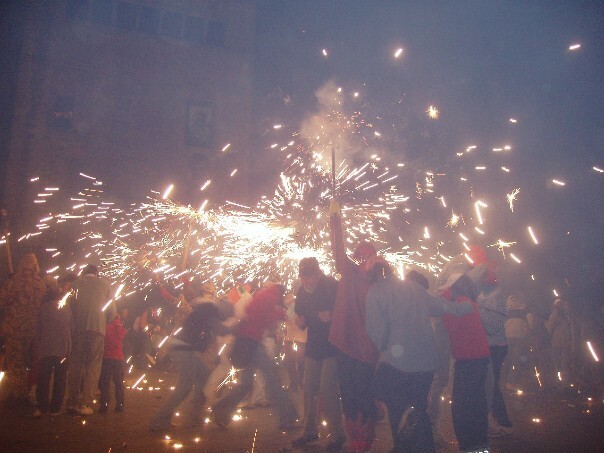 I got to experience the correfoc (fire run) with some friends in 2005 and I was the only one to actually brave the sparks and make a run for it. (pictured left) La Merce has been celebrated since 1902 and features fire breathing monster floats, drumming demons and human castles 6 people high. They didn’t call it the Festival of Flame for nothing! Want to see more steamy vehicles? Check out my vehicle gallery here! This entry was posted on November 23, 2013 by Phoebe Darqueling. It was filed under Artwork, Movies and Television and was tagged with 2012 Paralympics closing ceremony, Arts and Entertainment, Barcelona, closing ceremony, Coldplay, festival of flame, La Merce, London, Paralympics, Rihanna, steam punk, Steampunk.